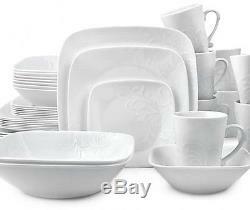 Dinnerware Set 42-Piece Corelle Cherish Square White Plates Dishes Kitchen. Have your best dinnerware pieces available everyday with the beautiful Corelle Boutique Cherish Serveware. It embodies the look and feel of fine china, but remains true to the durability that is Corelle's hallmark. 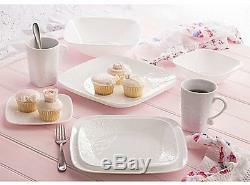 The Corelle Boutique Cherish 42-Piece Dinnerware Set will make any dining occasion a special event. These stackable and lightweight pieces will create an air of subtle sophistication to your meal. 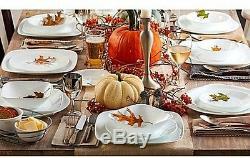 Set includes eight 10-1/4' D dinner plates; eight 8-3/4' D lunch plates; eight 6-1/2' D appetizer plates; eight 22 oz. Mugs, and two 1-1/2 qt. Made of glass and porcelain. Dishwasher, freezer, oven, and microwave safe. Our stock all ships from our US based warehouses. Only factory defects are accepted as a reason for a return. We guarantee that your issue will be solved quickly. We usually respond within 24 hours on weekdays. The item "Dinnerware Set 42-Piece Corelle Cherish Square White Plates Dishes Kitchen" is in sale since Wednesday, May 24, 2017. This item is in the category "Home & Garden\Kitchen, Dining & Bar\Dinnerware & Serving Dishes\Dinner Service Sets".bo502" and is located in Gilroy, California. This item can be shipped to United States.